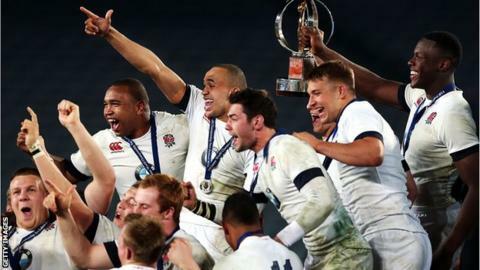 England retained their World Junior Championship crown as they survived a thrilling fightback from 2012 champions South Africa in Auckland. Jesse Kriel's converted try gave the Baby Boks an early 10-3 lead but England hit back and Nathan Earle's try helped make it 11-10 at half-time. A Joel Conlon try and penalty and conversion from Billy Burns gave England an eight-point lead. Kriel scored his second, Handre Pollard converting, but England held on. England were defending champions after a side containing the likes of full England squad men Jack Nowell and Anthony Watson beat Wales 23-15 in France last year. They set out to play with ambition from the first whistle and despite spilling the ball on numerous occasions, they had enough attacking ability and defensive grit to retain the title. England captain Maro Itoje praised the team for "sticking to the plan". "We believed if we stayed true to our principles, we would do well and we did, we won," added the second row. "This has been a fantastic tournament for us. Our boys have worked so hard and we got our just desserts - it's an amazing feeling." Handling errors stalled England's early momentum and, after both sides had got on the scoreboard with a penalty apiece, it was a dropped pass that gave South Africa the chance to score the first try of the game. The Baby Boks secured the loose ball and Kriel raced onto Pollard's inch-perfect chip to score. Pollard's conversion made it 10-3 but Aaron Morris banged over an enormous penalty from inside his own half to make it 10-6 after 36 minutes and there was still time before the break for England to take the lead. A brilliant Nick Tompkins break though midfield took England to within a metre and crisp passing gave Earle the chance to ghost outside Sergeal Petersen to score. Burns was just unable to convert from wide out but England, despite an error-ridden display and a totally malfunctioning line-out, led 11-10 at the break. Burns and Pollard exchanged penalties before England looked to have taken a decisive lead when Exeter back-rower Conlon was at the back of a driving maul to score England's second try. This time Burns converted to give England an eight-point advantage but he missed a kickable penalty as the defending champions dominated the third quarter, and South Africa came storming back. Kriel grabbed his second try with a superb finish to a sparkling South Africa move and Pollard again trimmed the lead to one point, but heroic defence meant it was Saracens forward Itoje who lifted the trophy as England retained their status as junior world champions. Replacements: Jack Walker (Leeds), Alex Lundberg (Wasps), Biyi Alo (Saracens), Hayden Thompson-Stringer (Saracens), Joel Conlon (Exeter), Callum Braley (Bristol), Sam Olver (Northampton), Henry Purdy (Leicester). South Africa: Warrick Gelant, Dan Kriel, Jessie Kriel, Andre Esterhuizen, Sergeal Petersen, Handre Pollard (captain), JP Smith; Thomas du Toit, Corniel Els, Dayan van der Westhuizen, JD Schickerling, Nicolaas Janse van Rensburg, Jacques Vermeulen, Cyle Brink, Aidon Davis.